The Cultural & Community Services Department offers Adult & Senior activities. Registration for all programs, classes and activities take place at Pelican Community Park, located at 18115 North Bay Road. Students will use Internet-based language programs in class and practice language at home. Students use a 10-part computer program to practice idioms, American expressions, accent reduction and grammar in this conversation-based format. Group assignments are based on skill level as determined by the instructor. Learn balance, strength, and defense skills with this specialized martial art. Uniforms available for purchase from instructor at additional cost. Join others who enjoy this art form and provide feedback and suggestions to develop each other. Participants are required to bring their own supplies. The City will store art in a secure location at Gateway Park. Free parking provided in the Gateway Parking Garage. Parking permit will be provided at time of registration. No instruction will be provided. Participants who miss two consecutive classes will be removed from the class roster. For taxpayers with low to middle income, especially 60+. Taxes prepared by trained volunteers provided by AARP Tax-Aide Foundation. Come to the Sunny Isles Beach Commission Chambers the first and last Wednesday of every month at 3:00 pm for some bingo. It is $2 for an 8 game session. Please check our Event Calendar for the next date or our Sunny Isles Beach Living Magazine. Community Blood Centers of South Florida organizes Blood Drives at the Sunny Isles Beach Government Center. Please check our Event Calendar for the next date or our Sunny Isles Beach Living Magazine. Each month the Cultural & Community Services Department organizes a trip, show, or event to a different South Florida venue. Ticket prices vary depending on the trip. Reservations are accepted on a first-come-first-serve basis. Learn basic CPR skills, rescue breathing techniques, choking prevention and key treatment of emergencies. This course is usually offered once a year, in January. This is a FREE course! Please check our Event Calendar for the next date or our Sunny Isles Beach Living Magazine. A convenient way to renew your license or auto tag. Driver License & Photo ID renewal services come to the SIB Government Center every month, including auto tags and disabled parking placards. Please check our Event Calendar for the next date or our Sunny Isles Beach Living Magazine. 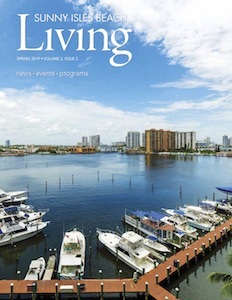 The Miami-Dade Public Library System provides Mobile Library services once per week, at the location, day and time listed in Sunny Isles Beach Living Magazine. Check your blood pressure and glucose levels with this FREE service offered by Mount Sinai Medical Center every month at the Sunny Isles Beach Government Center. Please check our Event Calendar for the next date or our Sunny Isles Beach Living Magazine. *Cholesterol screening is offered twice a year, in January and June. A monthly lecture series featuring medical professionals from Mount Sinai Medical Center discussing various topics related to your health and well-being. This series is provided as a service to the residents of Sunny Isles Beach as part of the community outreach of the Mount Sinai Medical Center. Learn to ballroom dance with a knowledgeable instructor. Please call the Cultural and Community Services Department at Pelican Community Park at 305.792.1706. “Latin Fusion” Dance involves structured movement, warm-ups, and group interaction. This class will combine elements of various styles of Latin dance (i.e., salsa, merengue, bachata, flamenco, etc.) in a low impact yet energetic dance/exercise workout. All levels welcomed. Joy is essential! Check out the latest edition of Sunny Isles Beach Living for up to date class schedules and fees.